One word: galette. But let’s back up. It’s that time of year—garden season is winding down and harvest season is winding up. Holy cow we have a ton of tomatoes this year. I’ve been putting them in salads of course, in soups, in casseroles, in pasta dishes, making sandwiches with them (BLTs and just plain tomato sandwiches). I’ve stuffed them, grilled them, sautéed them, fried them, and baked them. I’ve even pureed them for tomato sauces. And then there was the day of homemade salsa. We’ve been eating them for snacks, and then we took a load on our latest camping trip for more snacking. And we’ve tried giving them away. Good luck with that. Seems everybody’s got tomatoes coming out their ears. Now don’t get me wrong, I’m not whining or complaining (well, maybe a little); I’m truly grateful for this bounteous harvest, but mostly I’m explaining the dilemma of having too many of anything. So when I ran onto the idea of a galette, I was delirious with joy. A galette is a rustic pie—an open-faced pie, minus a pie pan. 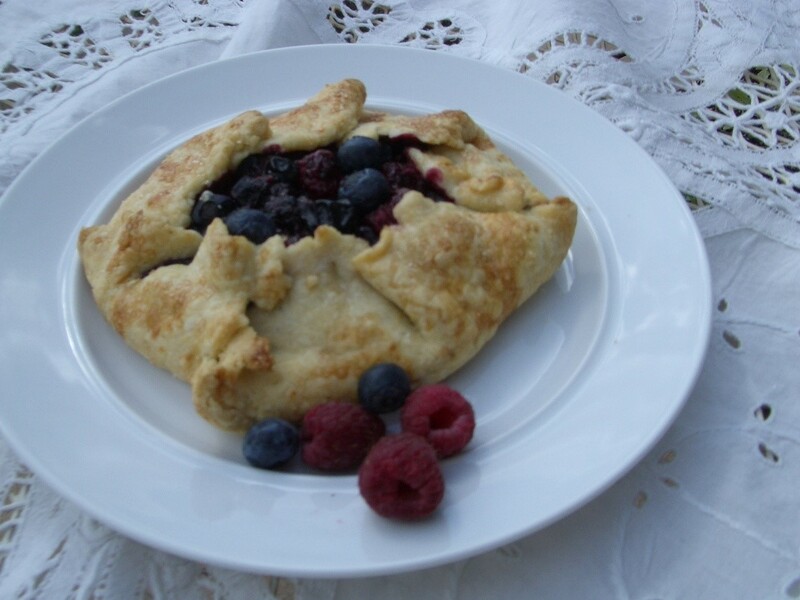 They often hold sweet fruit fillings and that was the first type of galette I’d ever heard of or tried to make (a mixed berry galette as shown). But it had never occurred to me that they can also hold all sorts of savory items—especially veggies. In this case, it’s gonna be tomatoes! There are two basic differences between this dish and a typical pizza topped with tomatoes. First, it’s the crust. 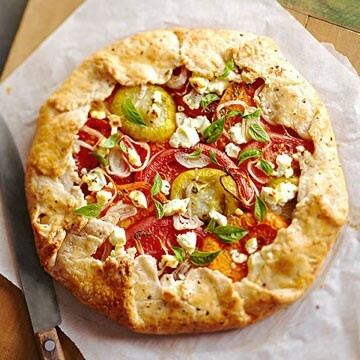 With pizza you usually use a yeast-based bread dough type crust. A galette employs a pie crust. If your end product is to be sweet (fruit filling), then you’ll want sugar in your crust recipe. If your aim is a savory dish, then you’ll omit the sugar and add perhaps a pinch of black pepper and maybe some dried oregano. The second difference between a savory galette and a pizza is the way the filling ends up. With pizza, your toppings are spread apart a bit; because there’s no crust pushing the toppings closely together, they retain their separate flavors and shapes. With a galette, the filling is so overlapped that things blend during baking. Shapes, flavors—there’s a melding that results. I found this idea when I was desperately surfing the web hunting for new fresh-tomato ideas. Turns out, savory galettes are all the rage now. Ideas and recipes for them are everywhere. But what makes the whole thing so attractive is that all you really need is an excellent pie crust recipe. The filling step is “anything goes.” Just roll out your crust into a large circle, square, or rectangle, and start plopping your ingredients on. Then pull up the sides and bake. Everything but the bacon and cheeses came from our garden. I placed tomato slices on the bottom, added all the other stuff, then topped it off with more tomato slices, and finished it with a healthy sprinkling of Parmesan cheese. This was a delicious and satisfying dinner. Satisfying especially because we grew this food, so it was fresh and loaded with nutrients. 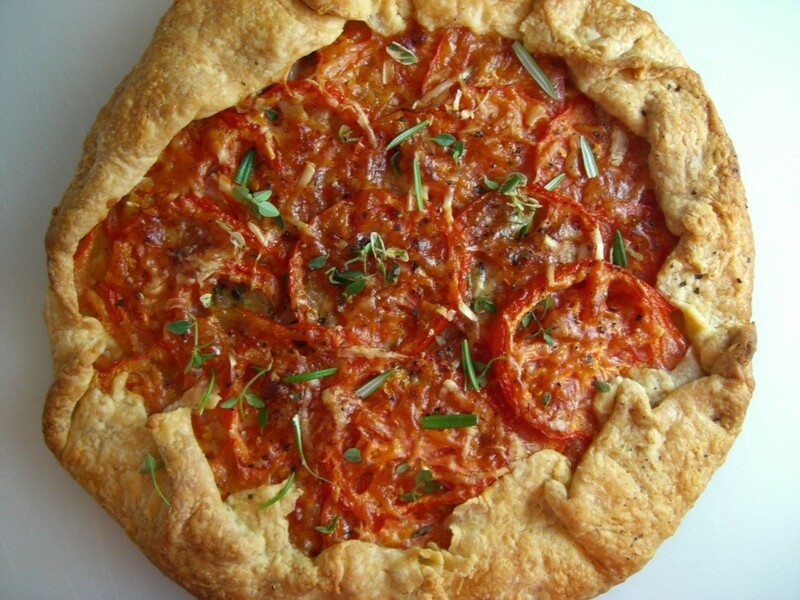 Anyway, bring on the tomatoes—galette’s the word!